If you have not yet read The Whole System Is Rigged, available free to all readers, please click here to read it first. About the kindest thing I can say about the reckless $trillions the central banking cartel flooding the world with is that they gave us more time to get our preparations in order. I certainly hope you used that time wisely. So what happens when every financial market around the globe has been dangerously inflated by massive money printing? Those enormous flows that were virtuous on the way out will be vicious on the way back in. And don't forget: as a combined group, the big central banks are still expanding their balance sheets today. Every single country on that list that is the proud holder of US denominated debt is now facing serious difficulties. Worse, the situation compounds itself as all of the debt holders have to sell their local currency in increasing amounts to buy the dollars with which they will pay off these debts. 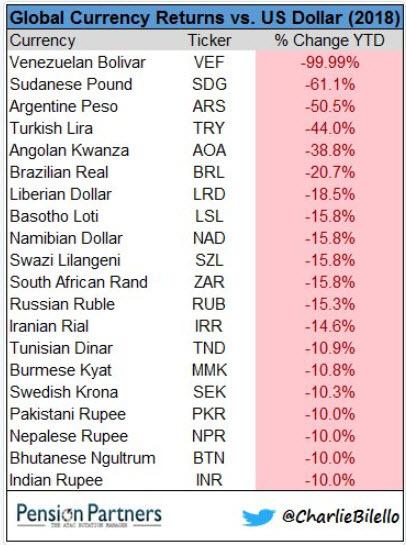 The more they sell, the weaker their local currency gets. The weaker it gets the more they have to sell. It's this dynamic that then bleeds over into their local stock markets. Companies being crushed by external dollar-denominated debts see their interest costs spike higher and higher. Very rapidly this crushes their income stream, so their stocks fall in price. The contagion is spreading, quite rapidly too. It’s well beyond a single story that we can confine to the particulars of Turkey or Argentina. It now involves India, for heaven’s sake! Next up is the big kahuna – the debt crisis that results when the individuals and companies toss in the trowel and declare bankruptcy or simply stop paying off their loans or debts. This is when the debt crisis starts.